This is a MEGA bundle of all the prayer packs that are currently listed in The Treasured Schoolhouse. There are 30 prayers included in this bundle! 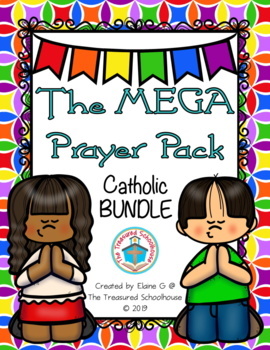 Buy the MEGA BUNDLE and save 30% off individual prayer pack prices! All prayers are the Catholic version, but may be suitable for other needs. These 430+ pages make great activities to go along with a prayer lesson, memorization, or there are a number of other uses! They are for a variety of ages/grades. *Except the "Nicene Creed" and Apostles' Creed" which do not have the cut and paste worksheet. 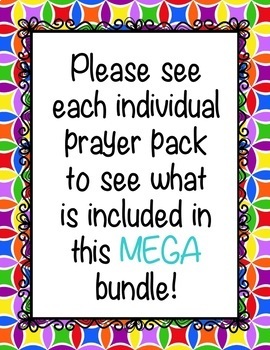 NOTE: If any other prayer packs are created and listed, they will be added to this MEGA BUNDLE. There are no plans at this time to add more, but should it happen, they will be added and the price will increase for each additional prayer pack. If you’re short on shopping time but want or need a little something extra, please take a look at my products in the “Bargain Bin” category. This product is NOT editable and uses standard U.S. spelling, unless otherwise noted. Please take a minute to read the product descriptions and to view the thumbnails and previews that are provided for this product. If you have any questions or comments or need a custom alteration, leave a message in my Q&A and be sure to check the box for “Email me when the seller responds” so that you will know that I’ve replied. For custom alterations being able to do it will depend on current workload and other factors, but just ask so I can help! All products are for personal or for use in a single classroom ONLY. If you’re interested in sharing with your team or co-op, please “Buy Licenses to Share” at a discount off the product price. All sales on TpT of digital resources are considered final and nonrefundable. Please make sure that you’re viewing with the most current version of Adobe Reader. The newest version is DC, but X or higher will work. Also, if you’re trying to open on a Mac, it will not open in “preview” and you will have to view in Adobe Reader If you don’t have it or need to update, please visit www.Adobe.com to download it for FREE. If you have any other technical issues after verifying and updating your version of Adobe Reader, please contact TPT support for further technical assistance, which is what they request be done.